Our organisation really owes its existence to the Apparitions of Our Lady of Knock in Ireland on 22nd August 1879. On that day Our Blessed Mother appeared to 14 people at the Parish church of Knock just after the saintly parish priest, Archdeacon Cavanagh, had completed, 100 consecutive Masses for the souls in Purgatory. It is generally understood that, apart from its other significance; this was a sign of approval from Our Lady with regard to the Masses said by Archdeacon Cavanagh for the Holy Souls. In the early eighties a group of people in Australia, in imitation of what Archdeacon Cavanagh had done, got together and made each a contribution in order to raise a stipend to have 100 consecutive Masses said by a priest for the benefit of the souls in Purgatory. That there does exist a Purgatory is a dogma of the (Church and that the best way to assist the souls in Purgatory is by having Masses said for them is defined by the Council of Trent. After the first novena was completed another was organised and still another and out of these efforts carne to exist the Friends of the Suffering Souls each member undertaking to, have one Mass said each year for the souls in Purgatory. This Mass is offered on behalf of the whole organisation and therefore there is a continuous novena of several Masses each day being offered on behalf of the organisation for the benefit of the souls in Purgatory. Each Mass is offered for all of the Holy Souls but with a special commemoration for deceased members. There are now 3,150 members throughout the world. Most of these are in Australia but we also have members in South Africa, Scotland, England, Ireland, the United States, the Philippines, Sri Lanka, Japan, India, Canada, Italy, Spain, SSPX South Africa, Papua New Guinea arid Nigeria. In Australia each member sends the stipend to the organisation and the organisation organises the Masses but in other countries each member organises his own Mass with a priest chosen by the member. Each member also has to confirm for us that he or she has in fact organised the Mass. 1. In spiritual matters the merit is multiplied by participation and not divided. Therefore each member receives the wine merit as if he had arranged each and every individual Mass himself. 2. The many souls who benefit from this great number of Masses will be eternally grateful and will pray for the interests of members whilst they are in Purgatory and when they are released into Heaven, They will never forget the members because the members did not forget them. 3. 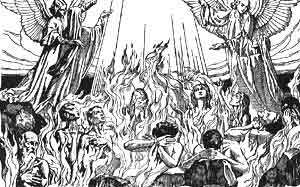 All of the Masses are offered for all of the souls in Purgatory but especially for deceased members. Therefore, after a member’s death his or her soul will enjoy the benefit of every single Mass organised by this organisation. If a deceased member has to pass through Purgatory, as most of us will, then they will be grateful they took care of others so that now others take care of them. Each year, shortly before the due date for the Mass, we send to the member a reminder letter of the obligation as well as a Newsletter and a Mass Request Envelope to give to the priest that he or she chooses to say the Mass. I enclose a copy of an application form so that you can publish the same in your bulletin. This might bring in some new members and this would be of great benefit for the souls in Purgatory for whom Our Blessed Mother so often begs for prayers. Unfortunately many people underestimate both the duration and the intensity, of Purgatory. These matters are not defined by the Church but the teachings of the Fathers and private revelations should be sufficient to convince us in both these matters. With regard to the intensity of the sufferings Our Blessed Mother told the saintly, French priest, Farmer Lemy, that, it is better to spend 15 years dragging your weight on earth rather than to spend 15 minutes in Purgatory. Thank you for your efforts to publicise the work of the Friends of the Suffering Souls: The Holy Souls will be extremely grateful to you for any new members which your efforts might bring in as each new member will mean another Mass added each year to the perpetual novena. Our Blessed Lord and His Holy Mother will also be very grateful for it is their earnest wish to see every soul in heaven as soon as possible.